Cambridge Islamic Sciences: Is Muhammad (PBUH) The Greatest Economist? Prophet Muhammad (PBUH) was no economist great or otherwise. He is the Prophet and Messenger of Allah (SWT). He came to teach people the Deen - Islam - submission and servitude to Allah, to give glad tidings about Jannah (Paradise) and to warn people about Jahannam (Hellfire). This is the mission of all the Prophets and Messengers. However he also brought some guidelines to protect this mission and to protect the individuals and the communities of people who are governed by that mission. One such example is his strong condemnation of greed for wealth and status. Today the whole economy is geared towards the fulfilment of such greed. This is reflected in every aspect of the economy from micro levels (individuals, families, businesses) to macro levels (national, international, global). The Islamic banking and finance industry was born in this economic philosophy. The difference with Islamic banking and finance was that it espoused the use of shariah based rules to structure its products and services instead of the conventional interest based rules. It proposed to offer an alternative to the interest based banking and finance. Intriguingly some of the multinational banks and financial institutions, the core players of the modern economy, have also embraced it. whether it is really an alternative or just the same but with different terminology? if it is a real alternative does it fit within the philosophy and ethics of Islam? i.e. is it helping people turn away from greed or is it simply helping them fulfil their greed in an alternative way? if the Prophet Muhammad (PBUH) were to be here today, would he have encouraged it or discouraged it? if he discouraged it, then what would he have proposed? These are questions that should trouble every Muslim, whether they are Islamic finance professionals or ordinary people, as they affect all of us. 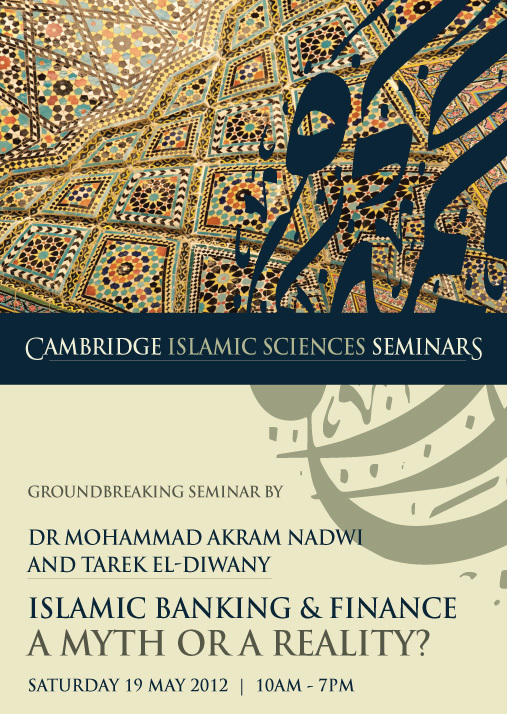 The forthcoming seminar on trade, banking and finance by Shaykh Dr Mohammed Akram Nadwi and Tarek El-Diwany is an essential step towards finding answers. You will also learn in this seminar why it might be an insult to call the Prophet an economist! Only 5 days to go, book your places now.